When you are visiting other countries, you don’t just visit them for their tourist spots. You visit them for their food. When you are in the Philippines you must try Adobo. There is not one menu in the country that that doesn’t include this dish. This is an entree that can use either pork or chicken as the main protein. The sauce is a mix of vinegar, soy sauce, pepper, garlic, salt, and some other spices. It is truely a delicious meal that most enjoy. Also, there is Lechon ( roasted pig ). Lechon is actually said to be the most invited guest to parties that are held by Pinoys and Pinays. Lechon is a very popular meal and is available all around the Philippines. But the best Lechon is said to be available in the Visayas region, specifically in Cebu City. Filipinos are known to be thrifty in so many ways and because of this thriftiness, Sisig was born. Sisig is a dish that hails from Pampangga. The main proteins of this dish are usually the leftover pork cheeks, head, and liver of the lechon. It is prepared crunchy and chewy through different cooking methods and served in a sizzling plate. 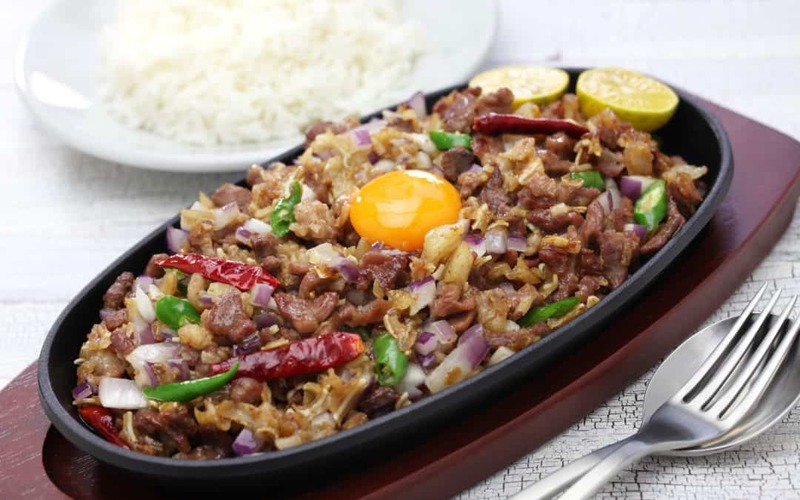 Although this dish originated from Pampangga, you can find sisig all over the Philippines. soy sauce, vinegar, and chili. Many Pinoys and Pinays love the “taba ng talangka”. In English, this means “fat of the crabs – the tiny ones”. As weird as it may sound, Pinoys and Pinays were able to process the fat of the tiny crabs and make it like a dipping sauce. But many places in the Philippines offer this sautéed in garlic and topped on fried rice. Palabok is the spaghetti of the Philippines. This is made out of rice noodles that is garnished with an orange sauce that is based on shrimp broth. Palabok is served with tiny pork cubes, pork rinds, hard-boiled eggs, and even oysters and squid. Much like everything else in this list, palabok is also available everywhere in the Philippines. Bulalo is a beef soup dish made from the beef shank marrow. Yes, you read it right – it is the marrow of the beef shank. This is mostly available in Tagaytay and Batangas, south of Manila. It is made in a broththat is rich in flavor as this is cooked by simmering the shank for hours. Wherever you go, be sure to explore the food that is offered. Filipino cuisine is just one reason why many people visit the country –second to their awesome tourist destinations, of course.